Here is a card for the man that I love. It was his birthday last week and I really wanted to make him a card. I was hard pushed as I had and still have two wedding invitation orders to fulfill, a with sympathy card to complete and the scrapbook for my sister besides working full time and spending evenings playing with ducks!. This was very rushed for me and I'm not completely happy with it. I couldn't find the 3rd plane decoupage piece in my messy craft room so had to go with what I had. I have since found it and will add it to the card before it is put away. I have used an excellent sketch created by the team over at The Next Level challenge blog. The twist was to use decoupage in you image. Check out their blog by clicking on the banner on my side bar. It's an excellent blog packed full of hints/tips, tutorials and prizes and the design team make some fantastic cards. Items used. 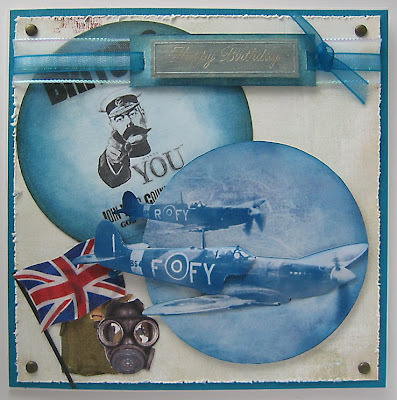 Paper/ Card - Blue Bazzill Card, Basic Grey Porcelain Paper (White) Planes taken from the Men in Mind CD by Lex Crafts Flag, Gas Mask & Poster taken from one of our many books on WWII! Ribbon & Brads I hope you like the card and thanks for looking.